The Tenant Relations Program began in 1983 with the hiring of registered Social Workers. At the same time, Newfoundland and Labrador Housing Corporation (NLHC) initiated a program to promote community development in social housing neighbourhoods. This program provided tenants with opportunities to work towards common goals and build a sense of community. There are over 30 Tenant Associations within NLHC neighbourhoods. Tenants, who join these volunteer groups, work together to make a positive difference in their community by selecting activities and programs that reflect the needs of their neighbourhood. If you are interested in becoming involved and would like to know if there is a Tenant Association in your neighbourhood, please contact one of the Tenant Relations Program Social Workers. As Tenant Associations mature and grow, they often require space to carry out their programs and activities. Over the years, NLHC has provided 10 Neighbourhood Centres for Tenant Associations in NLHC neighbourhoods around the province. Neighbourhood Centre activities often include regular meetings and special events of Tenant Associations as well as programs and services such as parenting programs, budgeting seminars and community kitchens offered through partner organizations. NLHC is responsible for 8 Community Centres . Each Centre is fully staffed and offers structured programs and services for families and individuals living in the neighbourhood and community. Through partnerships with other agencies, Community Centres provide a variety of programs such as homework clubs, healthy baby clubs, exercise classes and seniors nights. 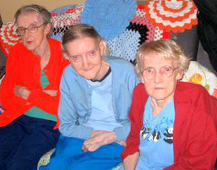 The Gillingham sisters have been tenants with NLHC since the late 1950s.